Large 14 Foot Crack in Headworks? Cracking Radial Gate Steel tendons? Threat to Spillway yet no Repairs in 2017? A threatening 14 foot crack growing in a massive 5 foot thick concrete pier at Radial Trunnion Gate 8 in Oroville's Spillway Headworks? DWR Board investigating how many of the internal cracking of the 50 year old aging "end of life" 384 steel anchor tendons may fail before they deem the Headworks operationally unsafe? Two steel tendons have already failed, test data reveals 28 more with crack indicators in the steel, some near the "critical failure size". Yet DWR doesn't know with certainty how many more are at risk of failure? Are there any plans to fix these major spillway Gate Headworks issues with emergency repairs for 2017? Why hasn't DWR revealed this information to the public? The Oroville Dam spillway will be repaired, but do deeper problems exist? LOS ANGELES, CA (California Network) - On May 11, 2017, at a California State Assembly joint oversight hearing at the State Capitol Building, for an update on the damaged Oroville Spillway, legislators were surprised in testimony that revealed new concerns regarding structural cracking issues in the Radial Gate Spillway "Headworks" in addition to the issue of the leaking "Wet Spot" on the dam. James Gallagher, Committee Vice-Chair, District 3, revealed this new information while grilling DWR for answers. As reported by Valerie L. Price , "Gallagher explains that at the "head-works of the spillway" there is a "diagonal crack in the left side of gate eight," and he reveals that "there's also a crack in the center of the head-works of the spillway." He states that the crack is serious. He asks, "Is there a plan to fix the head-works? You know, these cracks are probably going to require complete replacement of the head-works. What's the plan on that?" Bill Croyle states that DWR is focused on the emergency, but he says that a "small" team is considering "what the permanent repair would look like." Gallagher says, "The wet spot. The green spot... on the left groin." He asks if "piezometers" have been put in to monitor the wet spot. He says that originally, 56 piezometers were installed, but now only 3 are active to be read to monitor "the seepage and the pressure on those areas." He says, "I've heard it said that it's not a problem to the stability to the dam. Okay, well, prove that to me." Bill Croyle answers, saying, "I can't speak to whether there has been any instrumentation" installed to monitor the wet spot." This "structurally significant" near 14+ foot crack, with an offset of near 4 inches, is being monitored by DWR using red paint (See Fig 1). As the crack grows, more red paint is applied. In a Feb 3, 2015 California Division of Safety of Dams (DSOD) Inspection report, the inspector noted a new growth close to 2+ feet in length as "fresh red paint had been applied" . Why is "watching" with red paint the only action being taken? This concrete pier is 5 feet thick. For a crack of this magnitude to exist in a critical support structure area, near the Radial Gate Trunnion anchorage & pivot pin, it is surprising to hear that there are no planned repairs in 2017 to address this notable structural defect. Why "only" repair the main spillway to 100,000 cfs if the Spillway Gates may be under threat of failure at this flow rate? Further testimony, by Professor Robert Bea, Phd Professor Emeritus, Center for Catastrophic Risk Management, UC Berkley, as reported by Valerie L. Price , "Dr. Bea warns that "nature [is] unforgiving of ignorance." He makes 3 recommendations. "Look out for the spillway gates," because the inspection reports show cracks in the head-works, "that they've had to paint over the cracks, so you can watch the two sides moving relative to each other. And then you look at the anchor tendons for the gates; two of them are broken. The wet spots, have been explained away as natural. In my world there's nothing like that that's natural unless proven natural. The piezometers are a clue." He warns to pay attention to the wet spots, because they are "part of this problem of growing old." Implicit in his remarks is a grave warning of the potential for catastrophic failure of the Main Spillway gate head-work structure, and consequently, the earthen part of the dam." Professor Bea's testimony reveals another structural threat to the Radial Trunnion Spillway Gates in the "end of life" 50 year old steel anchor tendons. Two have failed at the spillway prior to 2000. Many more are known to have internal "flaws" that are typical of corrosion cracking . In fact, the US Army Corps of Engineers issued a report in 2013 over concerns of increased failure risk at dams from old and aging steel anchor tendons (called "Post-Tensioned rods") . Oroville DWR test data shows that every single gate of the spillway has defect "flaws" in steel anchor tendons with noted crack dimensions stated as "considered significant" in the original 2000 Ultrasonic testing report  (See Fig 2). Powerful Ultrasound is used to stimulate the ends of the exposed steel rods to look for "echoes" from "reflections" that internal cracks or flaws bounce back. However, DWR has found that this method is limited to a maximum of 4 feet and more specifically is useful to about 10 inches . This means that only 10 inches of a 40 foot total length steel rod is able to be effectively tested. This is a coverage of only 2.1% of the length of the rod. What about detecting defects in the rest of the 97.9% of the rod? If DWR is missing 97.9% in flaw detection, and within their limited 2.1% detection "tip area" testing ability - which discovered 28 "considered significant" reflector echoes indicating cracks - how could DWR know if the gates are near failure? Only when "failure" occurs will DWR know - just as a sudden failure of Radial Gate 2, from failed anchor tendons, occurred at Clifton Court Forebay Dam in 2013 . Pyramid dam has also experienced a tendon failure in their Spillway Radial Gates. Not only is there a pattern emerging to three dams failing in 50 year old anchor tendons, there is another common issue identified in substandard grouting around these anchor tendons - confirmed in all three dams . The original construction grouting was discovered to have "voids" that was believed to allow moisture to collect and accelerate corrosion cracking. With a common pattern of aging tendons failing, and a common pattern of insufficient or poor quality grout sealing protection around these steel anchor tendons, these common patterns should elevate the engineering concerns of a bigger threat exposure to sudden "failure" risks. Why not replace all of the high failure risk tendons at Oroville? DWR spent $827,000 in 2013 to emergency fix & replace 100% of the anchor tendons and refurbish gates at Clifton Court Forebay Dam (CCFD) for Gates 1, 3, 5 (plus the prior emergency fix in 2013 to Radial Gate 2) . Yet this 100% replacement of the tendons was triggered by another "emergency" at the CCFD dam. Isn't Oroville a more significant threat to the public, if there is a sudden failure, than the smaller Clifton Court Forebay Dam? The Army Corps of Engineers 2013 report notes that time increases the odds of this micro-cracking tendon failure mechanism - "older rods continue to be in-service and defects continue to slowly propagate until reaching a threshold total failure point" . At "end of life" aging of 50 years, grout flaws, and with continued time ticking away, when will this threshold escalation of "total failure" of tendons occur? Why wait? What is DWR doing to address this "sudden failure" risk potential? Answers to this question are difficult to determine as DWR has requested this information be noted as Confidential Energy Infrastructure Information (CEII) secret in FERC filings. However, there is a concerning pattern that does reveal itself when combining FERC/DWR letters and communications in a timeline from the original starting point in DWR's 2000 original Ultrasonic testing report. Communications reveal that FERC likely prompted DWR to take action from failures of anchor tendons at Pyramid Spillway and at Oroville Spillway . FERC/DWR communications show this concern from FERC documents to DWR of "catastrophic failure" issues from "..failure modes (connections, buckling, trunnion shear, anchorage, etc.) that lead to catastrophic failure of the gate. The consequences of catastrophic failure should guide potential recommendations and any future warranted remedial actions.". DWR's first attempt to verify the integrity of Oroville's 384 anchor tendons, was through a project with Lawrence Livermore National Laboratories (LLNL) to use low frequency ultrasound intended to test the full length of an anchor tendon rod . However this method was found to be unsuccessful. DWR then turned to the higher frequency based Ultrasonic testing which is limited to testing a short section of the end of the anchor tendon rod to 10 inches (i.e. for clear detection "echoes" of flaws). DWR reasoned a justification for an "adequate" coverage of this "short" 10 inch depth tendon testing as they "believed" the grout voiding defects and the moisture penetration of other failures were limited to the grip nut grouting port area . Yet there is no evidence of a study performed by DWR to establish the grout integrity, voiding, or other evidential flaw corrosion deeper within the full 40 foot length of Oroville's tendon rods. From this point on, the 10 inch "belief" seems to have became the 10 inch "proof" based on a sample justification from a few failed tendons. Another disturbing "engineering" modification to the description of what is considered a "defect" is revealed in Oct 31, 2012 FERC/DWR communications where DWR's original 2000 denoted report of a 1/32 inch "considered significant" flaw  was now redefined to be as 1/16 inch as "minor flaws" . How did this redefinition occur? In 2000, DWR notes a 1/32 inch flaw as "considered significant". Then in 2012, DWR's communications to FERC, surprisingly notes that 1/16 inch or less is a "minor flaw". This is an increase in crack dimensional area of 281% . In engineering, the clues of "rounding numbers" from a 1/32 to a 1/16 formulation is indicative of number fudging. If there were a true determination from new study findings supporting a change, you would likely find a value that is more precise in a dimensional area than simply from a "rounding of numbers". Why is this important? Because the known "critical crack failure" dimension has already been determined to be 1/8 inch from the original 2000 DWR failure analysis data . There is not much margin to be just "rounding numbers". Worse, DWR fails to reveal to FERC, in this Oct 31 2012 communication, that the original 2000 testing has TWELVE tendons that are ABOVE the 1/16 inch dimensional area. Cracks to not reverse themselves. Does DWR consider these 12 tendons "minor flaws" too? Then how may DWR answer that ONE of these original dimensional cracks is close to the 1/8 inch "critical failure size" . Accuracy in engineering specifications and communications, on such important failure related information, to FERC should be clear and concise. Did DWR intentionally leave out these facts to FERC? Why has DWR now introduced an "ambiguous" definition of "minor flaws"? Why introduce a new ambiguous definition while increasing to a "rounded fractional number"? Where is the supporting data to justify this new description & sizing flaw determination(s)? What does the DWR Board think of the Spillway risk associated with these "end of life" 50 year old tendons? Information to this may be gleaned from an August 2014 DSOD inspection report: "The tendon anchors are about 50-years old and could experience problems in the future based on the history of tendon breakage at dams of similar age and construction. The Board expressed concern about this and will make strong recommendations about the need to carefully monitor and test the tendons using the latest tools." . More alarmingly, the DWR Board has responded to FERC to address Recommendation R-1a from the Ninth Part 12D Safety Inspection Report for Oroville Dam by June 1, 2016 - of "That is, analyses that evaluate how many anchors may be lost before demand/capacity ratios and/or other performance parameters become unacceptable." . Essentially, DWR's Board has directed that analysis be performed to determine how many anchor tendons may fail to where the spillway is inoperable. In a normal safety review of a Potential Failure Mode Analysis (PFMA) at a dam, this type of calculation would be part of a safety assessment IF the dam had a low risk of failure of these anchor tendons. However, given that all of Oroville's 384 anchor tendons are at high risk and are "uncertain" on their "end of life" condition in internal cracking and progressing stress losses (plus elastic relaxation & concrete creep), this type of an action by the board should be considered a serious problem. Why? Because this may indicate that the backup plan is to anticipate the "failing" of these anchor tendons, due to the inability to fully test the 100% length of the tendons and due to the known pattern of failures encountered. If all of the tendons were replaced in the 2017 emergency repair effort, then these uncertainties of failure would be eliminated. Yet, DWR may be placing their hopes in a new testing technique called Dispersal Wave Testing . This new type of emerging technology requires a great deal of sophisticated Finite Element Analysis lab modeling and test jig verification to arrive at a confidence level to a tendon's test result accuracy. In fact, the first round of lab testing by FDH-Velocitel has been requested to be delayed in FERC/DWR communications as the original construction reproduction of the high-strength carbon-manganese-chromium steel was rejected from non-matching qualities of the original 1960's construction to test against. Thus the results of this field test to lab test validation will not be fully known until September 1, 2017 . This is too late for this cycle of emergency repairs to replace the anchor tendons. DWR and DWR's Board have been aware of this anchor tendon failure(s) and failure progression risk issue for over 17 years. DWR and DWR's Board also know that Ultrasonic testing has "limited depth and flaw detection capability" . It seems that DWR and DWR's Board has made a decision to risk an outright potential failure or another failure mode of a greatly reduced flow rate of the Radial Trunnion Gates by not including a priority to get these anchor tendons replaced as part of the emergency repairs in 2017. Yet, DWR nor DWR's Board has not made any public announcement as to this decision; the decision's affect to a potential failure risk; nor any explanation as to why the inferred lack of concern regarding the large structural crack in the Headworks. The documented evidence of risk is strong in the engineering decisions involved in this potential failure mode of the Radial Gates. All it takes is "jamming" of one of the gates, from a loss in structural anchorage, and then another crisis may strike Oroville in the 2017/2018 rainy season flows. Perhaps this brings to light another dimension regarding Oroville's legal exposure regarding this known paper trail of history of management, maintenance, and engineering decisions on the tendons and headworks risks - it is found in FEMA's Dam Safety Report book, Appendix F: "The Legal Risks Of A Major Dam Failure" . This time, a commentary of "a flat tire" or "you run your car out of oil" may not be adequate if these manageable decisions turn out to be "unsafe". Note: text markups, underlines, arrows, on images and documents for illustrative purposes and are not part of the originals. Fig 1. Large 14+ foot crack, with near 4 inch offset, is growing. DSOD monitoring growth with red paint. 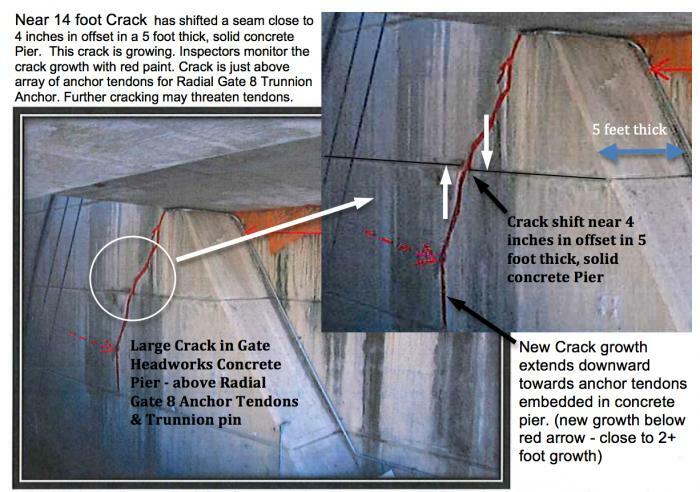 Large crack is in a critical structural support pier for Radial Trunnion Gate 8. Concrete Pier is 5 feet thick. Crack growing towards embedded steel Tendons for Gate Trunnion Pin anchorage. Fig 2. 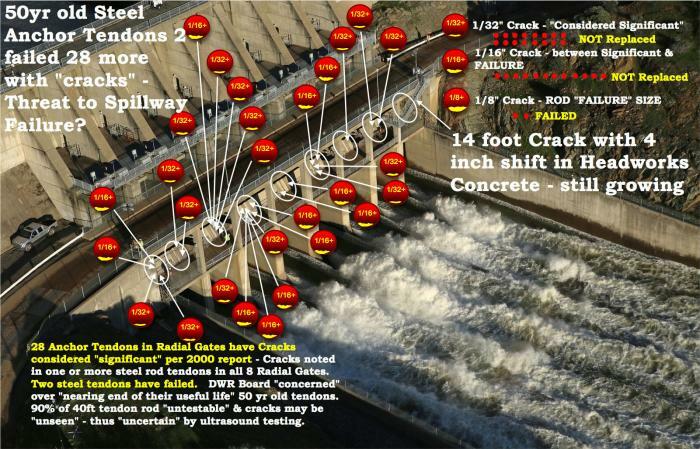 Map of cracked tendons, size of defects, and Large Crack 14+ foot location reveals the entire Headworks Radial Gate structure risks to all spillway Gates. No repairs scheduled for 2017. Not shown are the "spalling" chip cracking areas in the concrete supports to the spillway bridge. Note the steel plates in the bridge sections to reduce the flexure stress cracking/spalling from heavy repair vehicle load traffic. Large construction trucks limited to near 5 mph, one at a time, and centered in the bridge line. Flagger guides traffic. Fig 3. DWR board "expresses concern" over 50yr old tendons that are failing at dams of similar age and construction. Three dams have experienced tendon failures: Pyramid, Oroville, Clifton Court Forebay Dam. Fig 4. DWR doing analysis on how many tendon "failures" may occur before the spillway becomes unacceptable (inoperable outright or limited to reduced stress flow loads). DWR acknowledges that Ultrasonic testing is limited in depth and flaw detection capability. DSOD Feb 3, 2015 Inspection report - Picture 8 - "Red telltale paint, left, marks the extent of a crack in the Gate 8 pier. The recently refreshed paint shows that the crack now extends below the dashed arrow to the concrete chamfer. Monitoring should continue." "Post-tension rod loss occurs as an orthogonal brittle failure when a propagating cross-axial microcrack reaches a critical threshold. For ungrouted rods, this has resulted in rods being ejected under extreme velocities. Heavy retrofit cover box housings have been constructed to help contain failing rods. It is not known if the defect growth and resulting rod failure rate will stay at its relatively low number of a handful per year across the Corps inventory or whether it will increase as older rods continue to be in-service and defects continue to slowly propagate until reaching a threshold total failure point." Limited to 3 to 4 feet in entire 40 foot rod length - Page 4 1/32 inch at 10 inches can be detected - Page 4 (thus limited to 1/32 inch crack in 10 inches - infers that 97.9% of 40 foot rod not identifiable past 10 inches). Clifton Court Forebay Dam (DWR) Failed tendons causing Failure of Radial Tainter Gate 2 - corrosion induced - grout problem from original construction - 100% of anchor tendons replaced in 4 out of 5 gates since emergency failure of the Spillway. "incomplete grout coverage surrounding all these tendons near the anchor head" "Other information obtained from the results of NDT indicate loss of performance and potential deterioration of the original tendons installed during construction of the forebay. This includes relatively low remaining prestress in two of the tendons supporting Gate 3, and incomplete grout coverage surrounding all these tendons near the anchor head. Results from electrochemical testing indicate electrical connectivity between some tendons, as well as potential differences with nearby tendons that may have facilitated corrosion of tendons prior to the failure of Gate 2." DWR & LLNR low frequency full depth test project - to measure full length of anchor rods - was unsuccessful - https://elibrary-backup.ferc.gov/IDMWS/search/advResults.asp 19990322-0490(533695).tif March 3, 1999. DWR to FERC letter "Oroville Dam Radial Gates' Trunnion Anchor Rods Inspection. "Our original program, which included full depth testing of the trunnion anchor rods by Lawrence Livermore National Laboratories, was unsuccessful. Accordingly, the Department of Water Resources will inspect the upper 4 feet of each of the 382 anchor rods, using conventional ultrasonic testing equipment and inspection methods"  "The report documenting the results of the testing and detailed analysis will be submitted to your office by December 31, 1999." "conventional testing equipment is only effective at detecting flaws in materials up to approximately 4 feet in thickness or length. LLNL's research program was to develop a field testing method that could detect any flaws in the post-tensioned rods to full depth." FERC to DWR Re: Oroville Dam - Testing of Radial Gate Trunnion Anchor Tendons - August 1, 2012 - "This is to acknowledge receipt of the Department of Water Resources' (DWR) letter dated June 27, 2012 that transmitted the Oroville spillway gate trunnion anchor tendons testing report, part of the Feather River Project No. 2100. Given that the results of the ultrasonic testing are still under evaluation, DWR's request for a time extension to submit the final test report by August 31, 2012 is accepted." "We appreciate DWR's continued cooperation in this aspect of the Commission's dam safety program." FERC/DWR communications Oct 31, 2012 "We received the Department of Water Resources' (DWR) August 27, 2012 letter that transmitted the Oroville spillway gate trunnion anchor tendons final testing report." "We note that only minor flaws, i.e., 1/16 inch or smaller were discovered in the testing investigation." "DWR's plan to perform regular annual testing starting in 2013 is acceptable. Results of the annual testing should be included in the annual Dam Safety Surveillance Monitoring Report (DSSMR)." "By letter dated September 24, 2013, the Department of Water Resources (DWR) requested a time extension to address comments provided by the Federal Energy Regulatory Commission (FERC) on the 2011 Structural Re-Evaluation Reports of the radial gates for Oroville, Thermalito Diversion, Thermalito Forebay, and Thermalito Afterbay dams. Subsequent to DWR's request, engineers from DWR and FERC held a productive conference call on December 3, 2013, during which FERC engineers provided additional guidance. DWR understands that future re-evaluations should focus on failure modes (connections, buckling, trunnion shear, anchorage, etc.) that lead to catastrophic failure of the gate. The consequences of catastrophic failure should guide potential recommendations and any future warranted remedial actions." "The tendon anchors are about 50-years old and could experience problems in the future based on the history of tendon breakage at dams of similar age and construction. The Board expressed concern about this and will make strong recommendations about the need to carefully monitor and test the tendons using the latest tools. Ultrasonic testing of the anchor rods has resumed. At the suggestion of the Board, more informative testing methods are actively being pursued by O&M." "Although FDH-Velocitel has indicated that field NOE results of the P2100 dams did not reveal any irregularities in the tendons, DWR respectfully requests an extension of September 1, 2017 for the submittal of NOE test results for Oroville, Thermalito Forebay, and Thermalito Afterbay Dams. DWR anticipates a delay in submittal of these test results due to difficulties in procuring 40-foot long steel tendons that match as closely as possible the modulus of elasticity and guaranteed ultimate tensile strength of the in-service tendons. The first steel tendon vendor engaged by FDH-Velocitel manufactured tendons of suspect quality. FDH-Velocitel, DWR engineer's and DWR's metallurgical consultant continue to vet other manufacturers' proposals and samples to ensure the steel tendons procured for prototype testing provide the best match to the in- service tendons. This additional effort will help minimize uncertainty in FDH-Velocitel's testing and analysis." "A contributing factor to the delay includes DWR's desire to submit the entirety of FDH-Velocitel's study that includes field NDE results, modeling, and prototype testing, rather than solely field testing. DWR anticipates submitting comprehensive studies for Oroville, Thermalito Forebay, and Thermalito Afterbay Dams in advance of the requested September 1, 2017 deadline, and a comprehensive study for Pyramid Dam well in advance of the February 1, 2018 deadline." 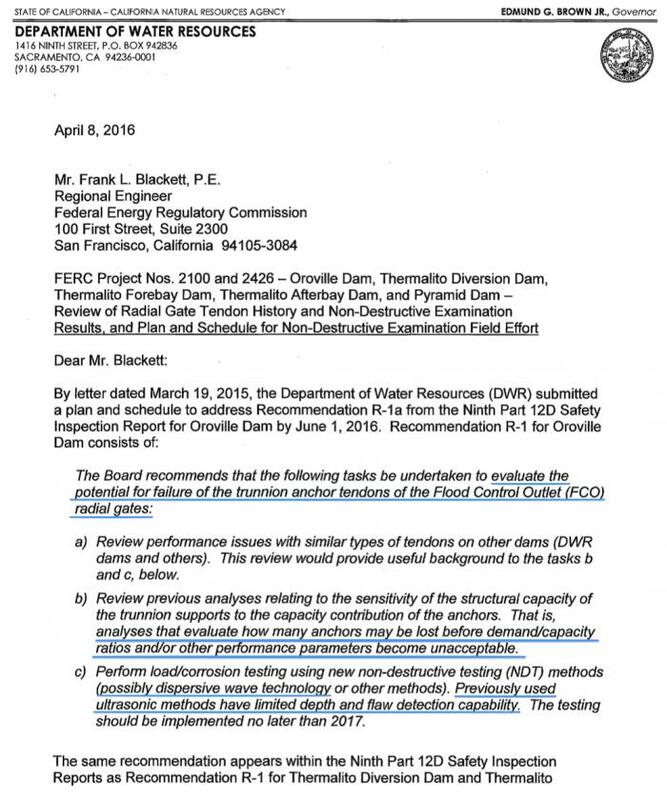 "By letter dated April 8, 2016, the Department of Water Resources (DWR) provided a plan and schedule for the non-destructive examination (NOE) field effort for the radial gate tendons at Oroville Dam, Thermalito Forebay Dam, Thermalito Afterbay Dam, and Pyramid Dam. In 2016, DWR procured the services of FDH-Velocitel to conduct field dispersive wave testing of the tendons as well as finite element modeling and the construction and testing of full-scale prototypes for calibration and validation purposes." a) Review performance issues with similar types of tendons on other dams (DWR dams and others). This review would provide useful background to the tasks b and c, below. b) Review previous analyses relating to the sensitivity of the structural capacity of the trunnion supports to the capacity contribution of the anchors. That is, analyses that evaluate how many anchors may be lost before demand/capacity ratios and/or other performance parameters become unacceptable. c) Perform load/corrosion testing using new non-destructive testing (NDT) methods (possibly dispersive wave technology or other methods). Previously used ultrasonic methods have limited depth and flaw detection capability. The testing should be implemented no later than 2017." "We live in a litigious society. One of the risks of a major dam failure resulting in a loss of life or sub- stantial property damage is litigation. The victims will seek compensation for their losses and the State may bring criminal prosecutions."